Slice the steaks into thin strips and place in the marinade. Leave out while you do the rest of the prep so the steak can become room temperature in time to be cooked. Time the starting of the rice so it will be ready when the beef is. Thinly slice the onion, dice the garlic, chop the cilantro and jalapeños. 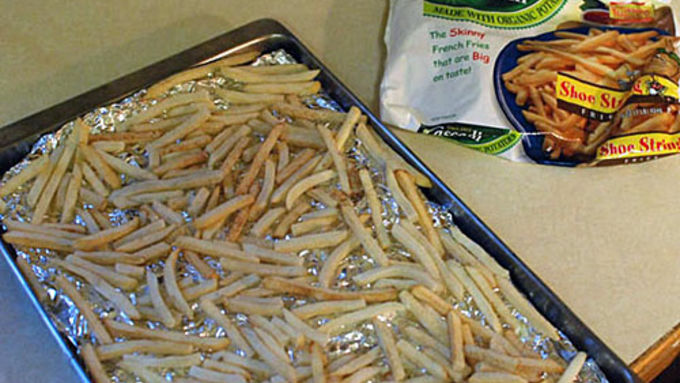 Cook the fries to the package instructions. Start the onions in some olive oil and cook until softened, about 3 or 4 minutes. Add the beef and marinade, cook 3 minutes. Add the jalapeños and tomatoes. Cook 3 minutes. 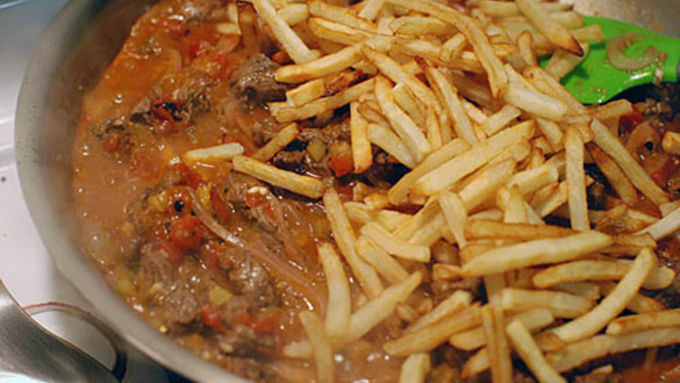 Add the fries, mix, and remove from heat. 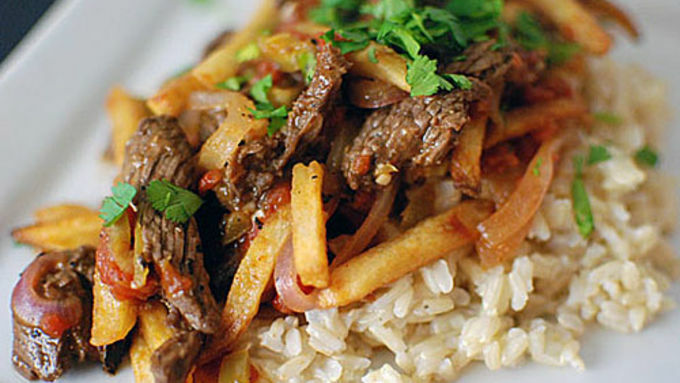 South American cooks have this magic way of combining meat and potatoes with vinegar and creating really amazing flavors. 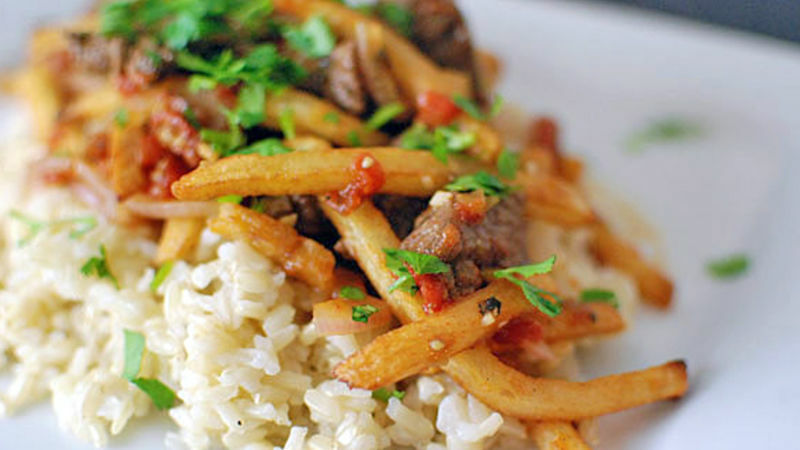 This steak and potato stir fry recipe (known as Lomo Saltado) is Peruvian in origin, but has elements of Asian and American cooking. When I first found out it existed, I knew it was my kind of food, and had to make it for you guys right away! I’m all for making French fries from scratch, but it is a ton of work, and frozen fries work great for a dish like this. Make sure to choose a nice thin variety. Beautiful and tasty. 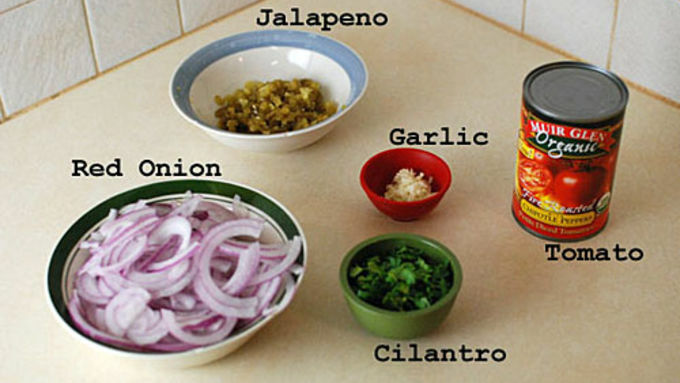 Just the right amount of acidity from the vinegar, spice from the jalapeno, and savory from the meat and onions.